Every once in a while, we get a comment or question from a reader at the Tallahassee Real Estate Blog that stimulates the continuation of an article, and today is a great example of how our readers are able to bring street level opinion to others who are also looking to sell a home in Tallahassee or buy a home in Tallahassee. While this is a rather long blog post for me, it covers important territory on the real costs of building a home and why today's existing home sales market cannot be beat by even the shrewdest of building budgets. Paul's insights offer quite a few points to consider, so I will just take them one at a time. 1. There are great deals to be had on vacant land - I agree with Paul, in that land prices have dropped substantially all across the Tallahassee real estate market. For this reason, there are still new construction opportunities which allow somebody to buy a new home and pay an amount similar to what existing homes fetch in those communities. But is this good for somebody who will build a home there in the near future? As you will see in my response to the second point, building a home in a neighborhood that is adding inventory means that new homeowner will be in a negative equity position far longer than building somewhere else (or buying an existing home ANYWHERE). 2. Some neighborhoods have the amenities or location advantage that has kept prices stable for the past 2 years - Unfortunately, this just is not correct. I am not aware of any neighborhood in Tallahassee which has sustained its home values over the past two years. The two neighborhoods mentioned, Golden Eagle Plantation and Southwood, have been reported here on a regular basis, and their home values are dropping. 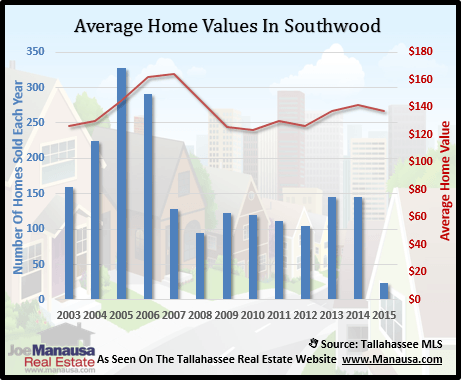 As a matter of fact, the graph below shows why some people might think values are stable in Southwood, when in fact it is the new home sales that are propping up averages, even while existing home sales continue to depreciate. The graph above tells the story of existing home sales falling in value (blue line), and increased prices for new homes (red line). So if you were reading about "average home values" in Southwood (the green line), you would see that they are going up! This is an unfortunately inaccurate conclusion based upon a misunderstanding of the new construction impact on Southwood. Southwood home owners are having difficulty selling homes, all the while new construction is being built and adding to the inventory of homes for sale in Southwood. Because land prices have been slashed there, new construction can compete with existing home owners on price, but this will not last for long. As existing home values continue to decline, new construction and land will have to decline in parallel or the market will just disappear. And since Southwood is adding homes in a time of glut, their housing market recovery will take longer than those neighborhoods that are not building new homes. 3. A custom home on the golf course can be "had" for less than $120/sqft (including land) - I think Paul means that you can buy a home already built for that price, but certainly you cannot expect to build one for that price. Just taking it "by the numbers" I will show you why. The lowest priced golf course lot for sale in Southwood is $75,000, while the lowest priced golf course lot in Golden Eagle is $229,900. Here is a simple table that shows the expected costs for somebody wanting to build the least expensive home possible on either the Southwood or Golden Eagle Golf Course. I am not a builder, so my costs estimates might be slightly off, but I seriously doubt you can build equivalent quality (compared to what exists now) for less than the table proposes, but there are existing homes for sale that are significantly lower than these construction cost estimates. The table above shows that Paul would have to buy the cheapest golf course lot in Southwood and build a 5,000 square foot house to bring his total cost down to $125 per square foot, assuming he can get the home approved and a builder to agree to a $110 price per square foot for a home with all the amenities that are typical in a Southwood golf course home. And he can forget about even coming close to his expectations in Golden Eagle. 3.b. Finally, Paul is expecting construction price to come down in the coming months also. Again, I have to disagree with this. Just in case my "street opinion" was off, I checked out several websites that project and forecast construction costs. All indexes that I could find showed a history of rising costs and a forecast for rising prices. Just two days ago, the Turner Building Cost Index released an opinion of a "slight cost increase." While this is for commercial construction, residential and commercial share a lot of common costs. I have seen no reports from the NAHB or anyone else for that matter expecting costs to decline ... why? Because labor is not dropping for residential construction. The crews that build houses are already working near minimum wage, and the crews of the commodity suppliers have seen their wages increase over the past three years. Times are tough, but people will not work for free, and people (labor) drives the cost of building a home. Every stick and brick in a home has a large labor cost that helped produce the final product, not to mention the labor to install it. Even if we see a slight decline in costs in the coming months or years, it will not be sizable enough to justify building a home on the basis of value. People should build a home because that is what they want to do, not because they think they can compete with the values in the existing home sales market. My thanks to Paul for an thought provoking comment, but I have to stick with my conclusion from yesterday. You should build a new home if that is what you want, but not because you think you can even come close to what is available from the glut of existing homes for sale in Tallahassee. The new construction costs are 38% above the resale market, so most buyers should take advantage of this and think "value" when they buy their next home.